Hey dear student's, today I'm going to share a short paragraph on Water Pollution for SSC and HSC level students. You can find the paragraph with Bangla meaning in our Bengali Version website. 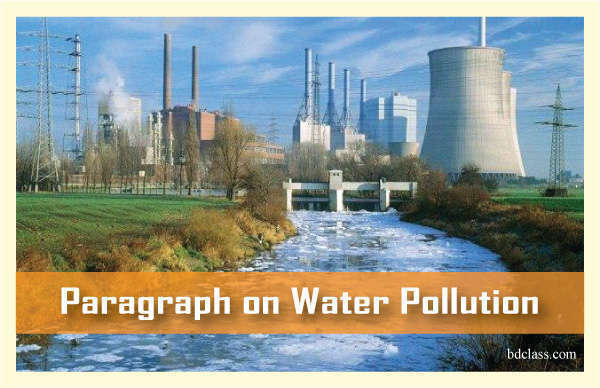 One more thing, you may write the name of paragraph as Causes of Water Pollution, Water pollution in Bangladesh, Effects of Water pollution etc. What are the bad effects of it? How can we solve water pollution? Water, an important element of the environment, is essential for human and plant life. It is next to air. But it is being polluted in many ways. There are many causes of water pollution. Firstly throwing waste and filth into water is responsible. Secondly using chemical fertilizers and insecticides in the field is also responsible, thirdly throwing oil, food waste and human waste into the rivers by boats causes water pollution. Besides insanitary latrines on the banks of the rivers and canal and drains running into the rivers and canals cause water pollution. Polluted water is harmful to us. It causes many incurable diseases. It kills the fishes of the river. First of all, The government should come forward to solve the problem. we should make the people aware of the matter. Mills and factories should not throw the waste and damaged products into rivers and canals. Steamer, motor launches and sailboats should not throw oil, food waste and human waste into the rivers and canals. We should not build insanitary latrines on the banks of the rivers and canals. It causes many incurable diseases.